I can’t say I’m the biggest fan of birds. They tend to like to poop on my head. Though if they were to start delivering my mail, I may change my mind. And my dislike isn’t going to stop me from feeding birds at zoos. I bring up birds because because the DIY Challenge from Adventures in Making is Birds of a Feather. I went through a vast spectrum of ideas before settling on a variation of an idea I didn’t get to try last month. 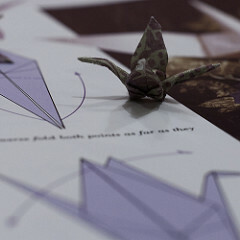 I dug out my origami book and a few pieces of paper. I started by practicing with a 4 x 4-inch piece of paper to make sure I knew the steps. 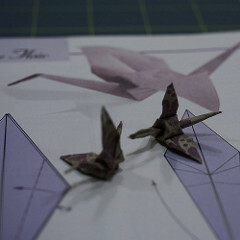 After a few practices, I settled on using a 1..5 inch square to make the crane. I used scrapbooking paper to make the birds since I have a rather large supply of scrapbook paper. This helps with sticking to my resolution of using supplies I have on hand. I painted on a coat of Mod Podge to give a little water proofing. 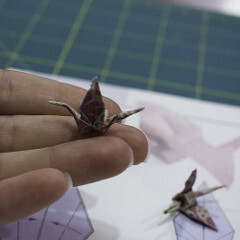 To turn the cranes into beads, I took a silver head pin and seed beads. The seed beads were to provide a larger area in case the holes in the paper stretches any. I used some 8mm pearl beads and jump rings to dangle the paper cranes. Check out what is going on with my cottage bakery. I'm sure to be baking up something delicious. Keep Me Posted by Email!